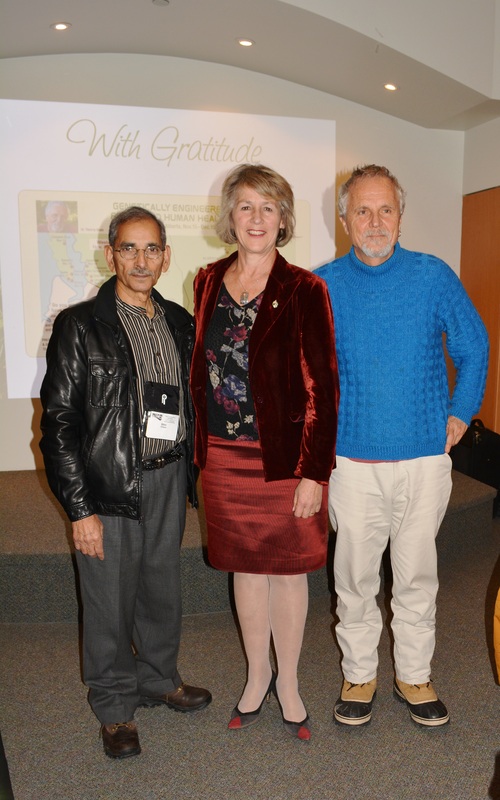 It was an inspiring, motivating evening between the two scientists, Dr Vrain and Dr Chopra. Dr. Thierry Vrain emphasized that GMOs aren’t about feeding the world – they are about selling weed killer. Dr Vrain explains that the technology itself is terrifying and untested. It’s not just that we humans are splicing together DNA across species and genus, biological orders and kingdoms but that we don’t know what’s being disrupted in this very imprecise process. All peer-reviewed, long-term animal studies show cause for alarm and cause for an immediate moratorium on this failed technology. Dr Shiv Chopra all but led us on a salt march. He is leading the charge in his 79th year, galvanizing the population. Dr Chopra spoke about the fundamental right of all citizens to have safe food. Because of Dr. Chopra, who stood up for the citizens of Canada, we don’t allow Monsanto’s bovine growth hormone in our milk. (The US wasn’t so lucky). Both Dr Chopra and Dr Vrain are people’s heroes for blowing the whistle. …it’s not an understatement to call this a public health crisis. This entry was posted in Mobilize and March, Right to Know, The Environment, Trail-Blazers and tagged Agent Orange, Agriculture and Agri-Food Canada, Corrupt to the Core, Dr Shiv Chopra, Dr. Thierry Vrain, GE Foods and Human Health, Genetically modified organism, GMOs, Joyce Murray, Memoirs of Health Canada Whistleblower on November 29, 2013 by Gurdeep Stephens.